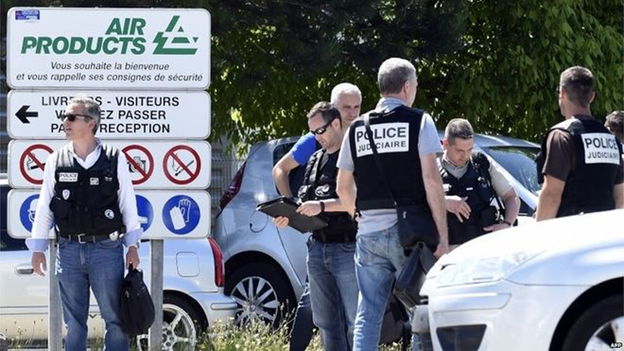 A man has been beheaded and at least one other person injured in a suspected Islamist attack on a gas factory near the French city of Lyon. 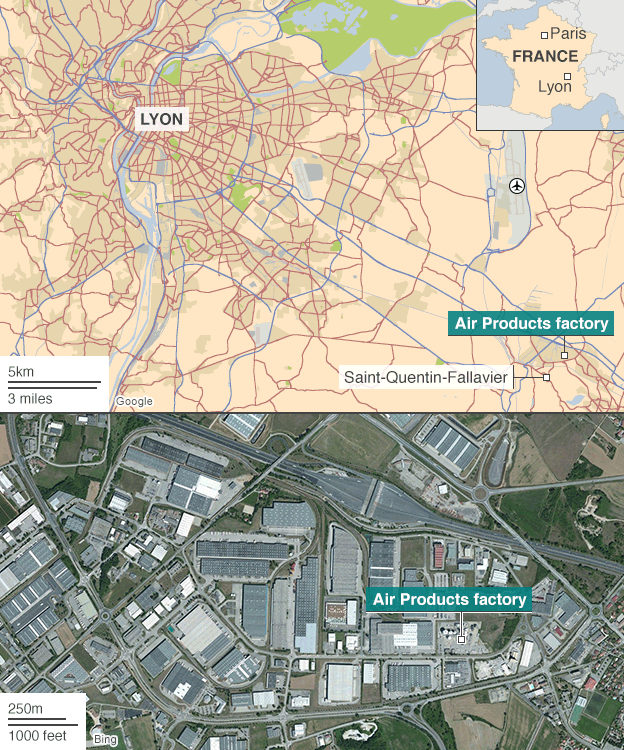 There were several small explosions, possibly caused by gas canisters, at the Air Products factory in Saint-Quentin-Fallavier, sources said. A man has been arrested by anti-terror police, officials say. Reports suggest two attackers drove into the factory carrying a flag with Arabic writing on it. French President Francois Hollande will leave the EU summit in Brussels this afternoon and return to France. He is expected to give a news conference before travelling. Interior Minister Bernard Cazeneuve is said to be on his way to the scene. The attack occurred around 10:00 local time (08:00 GMT), according to local media. According to French news agency AFP, Arabic writing was scrawled on the victim's head. French Prime Minister Manuel Valls has ordered that security be stepped up at sensitive sites around Lyon. The attack comes nearly six months after Islamist attacks in and around Paris that killed 17 people.